Here is our first attempt at cooking blue nose bass. 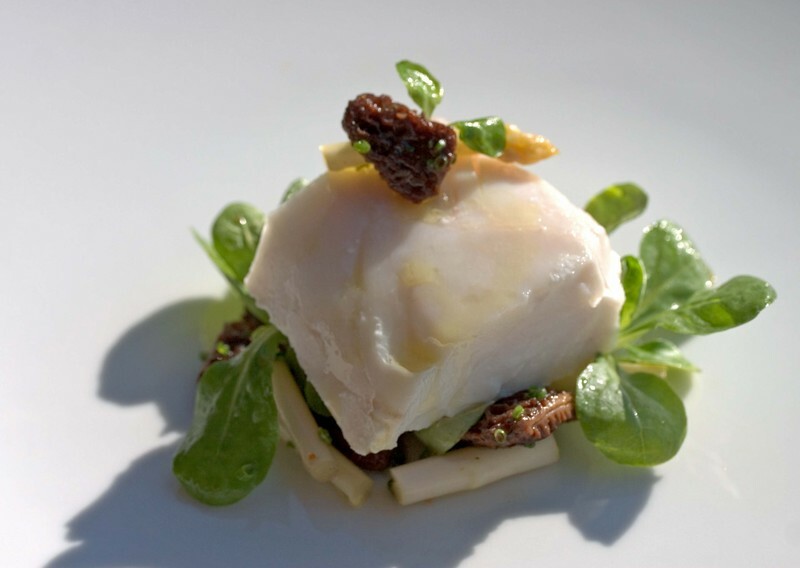 We poached it sous vide and served it on a salad of white asparagus and morel mushrooms marinated in maple vinegar. A few sprigs of mache add a crispness to the rich dense fish. A drizzle of olive oil finishes the plate. It's surf and turf for the scientifically minded. 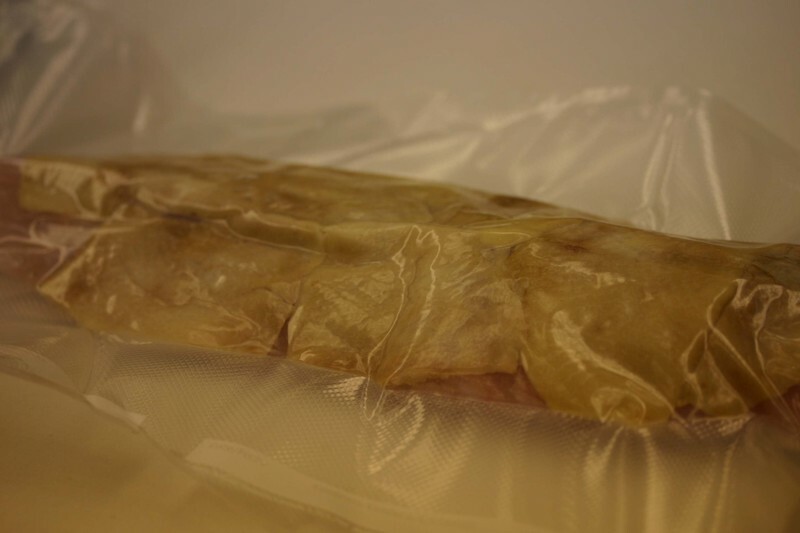 Veal tenderloin was slow poached in a bag with butter in the immersion circulator. 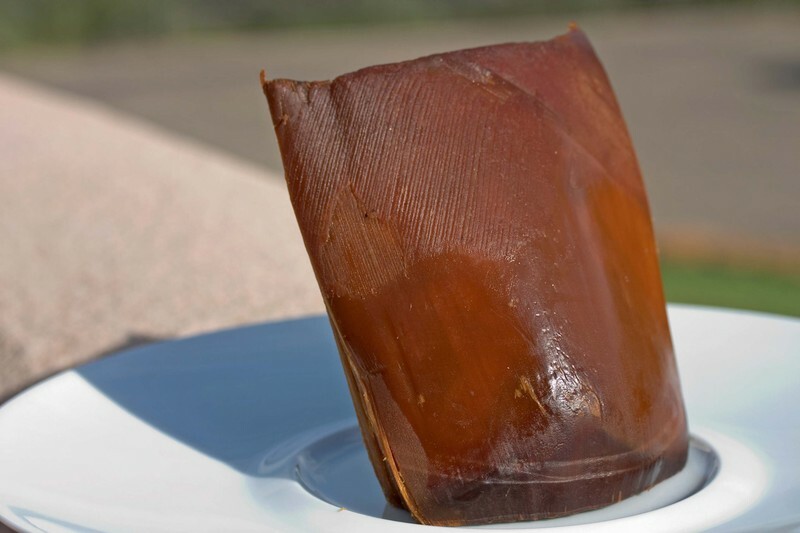 The shrimp sheets were made by pureeing raw shrimp with transglutaminase, spreading it between two sheets of acetate and poaching it. We warmed the sheets for service in a brown butter emulsion and draped it over the poached veal. This was paired with a ginger-espresso sauce and a cucumber-Anaheim pepper salad that was lightly marinated in maple vinegar. It seems a bit labor intensive as I write this but the flavors and textures came together beautifully in the final dish. When we were in Aspen we went to a great mezcal tasting which Aki has previously described in detail. I came away from the tasting slightly buzzed (the mezcal was just to tasty) and inspired. On the tables for the tasting there was a product similar to sugarcane. Its taste was rich, decadent, caramelized and slightly smokey. It was slow roasted agave. This is the stuff great mezcal is made of. Unfortunately it is not available here. This stuff was smuggled in from Mexico. It turns out the Agave was "imported" from the Del Maguey distillery. I was lucky enough to be sitting with a representative from Del Maguey and he gave me a large chunk of the agave. I was so excited, my mind was reeling with ideas for this product. 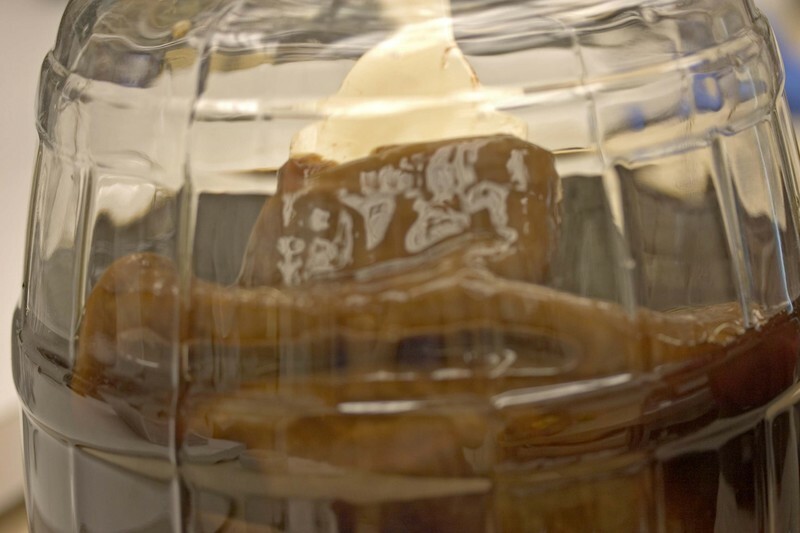 Currently, we are making a roast agave ice cream and are bottling our tequila vinegar with strips of the agave in the bottles. I also planned to do slow cooked fish on agave planks, but first I need to figure out how to get this incredible product into the country. For now I only have just this small amount. Many times simple is key. My case and point is a salmon dish we did last evening. In appearance it is simple. In execution there are many small steps which lead to the final product. 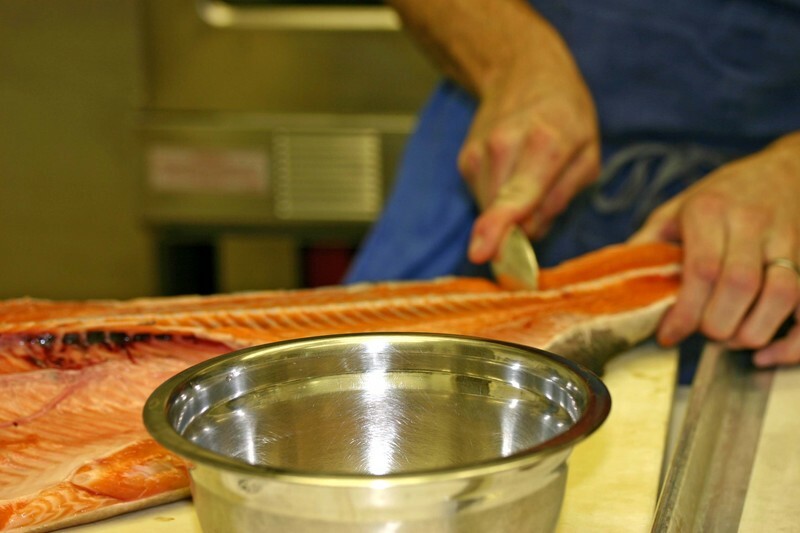 We butchered the salmon and adhered the belly to the top loin to create a dual textured uniform piece of fish. We used the odd trimmed pieces of fish to make rillettes of salmon. We slow cooked the salmon pieces and folded in clabbered cottage cheese, hot sauce and creme fraiche. We then scraped the bones and used those scraps to make salmon fluff. (I really should just use the Japanese name, which I do not have in front of me, so I still scramble for English language descriptions.) 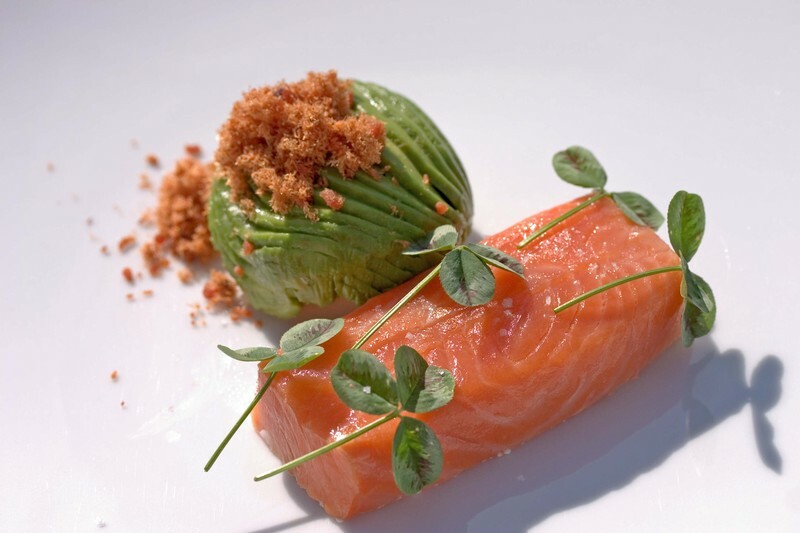 We stuffed sliced avocado with the rillette and slow cooked the rectangles of salmon. 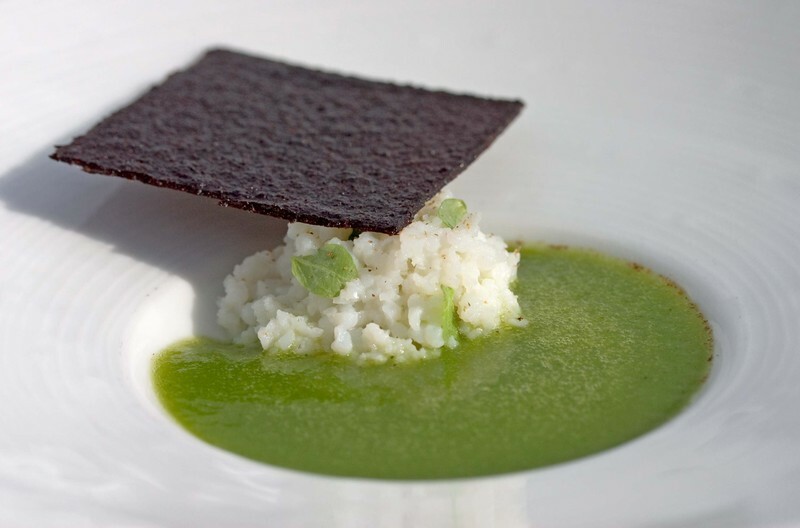 The avocado is seasoned with the salmon moss and the slow cooked fish is adorned with dragon's blood clover. I really like the grassy bitterness of this edible weed. The dish really is simple, using the many parts of the fish in one course. It is just the fact that in order to get to the end point one must complete a series of simple steps and applications. This cheese is fabulous. 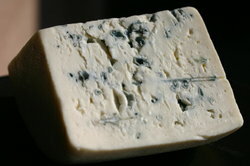 It's Smokey Blue from the Rogue Creamery in Oregon. It's drier than a Gorgonzola with a clean tanginess that keeps the richness in check. As you chew it, it melts on your tongue into an unctuous smokey pleasure. It's just so good we had to share. We served it last night with scallops. We seared fat U-10 diver scallops in a smoking pan, basted with butter and set them aside to rest. We tossed the excess fat from the pan and then deglazed with lemon juice and petite arugula. The arugula just wilted and picked up all of the crusty caramelized bit from the pan. We served the scallops and arugula with Jack's Black Lime Ketchup and crumbled smokey blue cheese. It was a simple and delicious dish for a summer evening. But frankly, you could just eat the cheese by itself with a crusty baguette, some cherry conserves and a great dry rose wine like the ones made by Domaine Tempier in Bandol or Van Der Heyden in California. We have combined tomatoes and passionfruit before in the form of passionfruit shortbread with tomato powder. Last evening we brought these two tastes together again. In last evening's preparation we marinated peeled tomatoes in a passionfruit caramel. The flavors mingled and the tomatoes became tender and delicate. 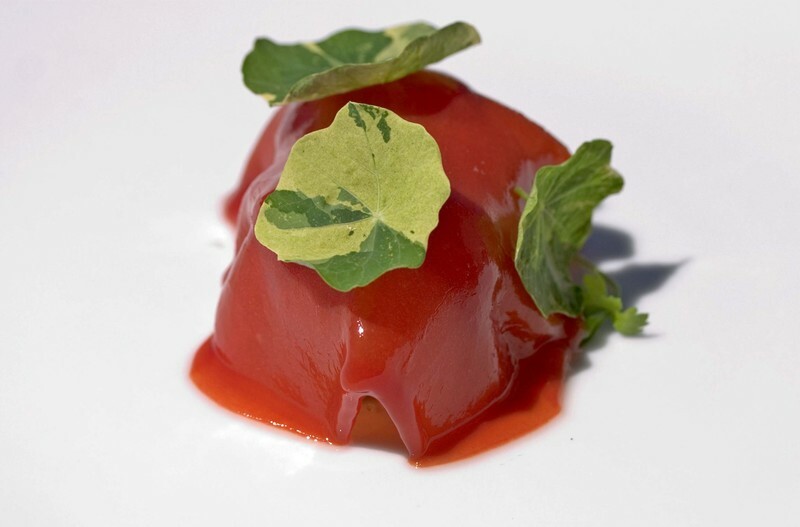 In fact, looking back at these tomatoes they took on a ravioli like characteristic with the flesh being the pasta and the seeds and insides being well, the filling. 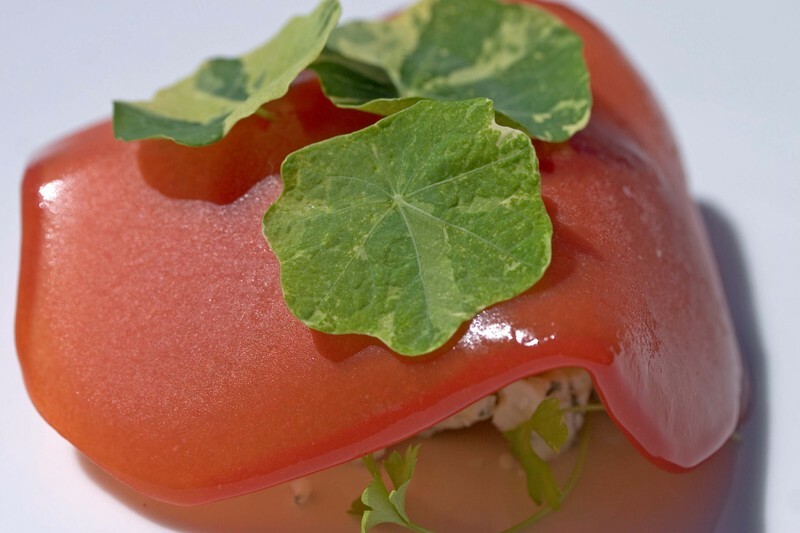 We served these marinated tomatoes on olive powder and then crowned with smoked sea trout roe and young tarragon. 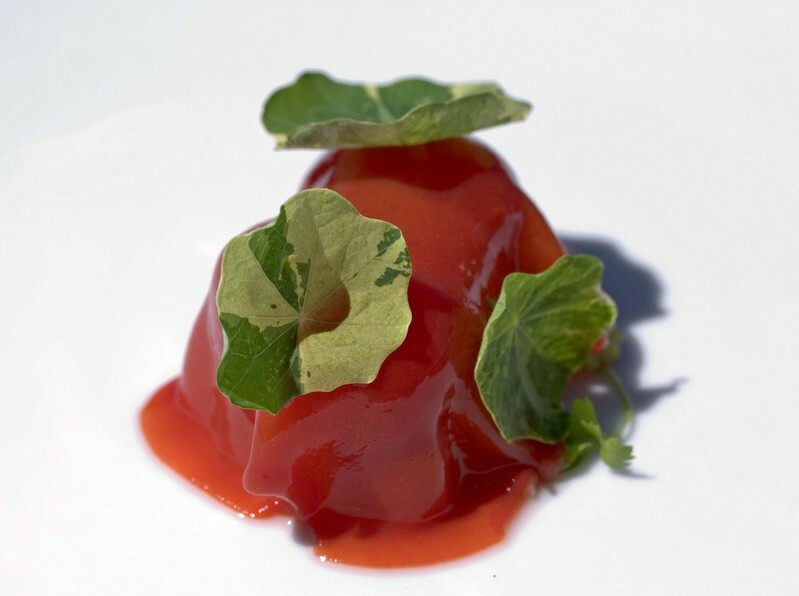 While I began with the notion of readdressing the beautiful marriage of tomatoes and passionfruit I am now caught up with the idea of marinating tomatoes with other flavors to create this explosive product. I had a blast preparing lamb loins from Grass Roots Meats for yesterday's menu. I boned out the saddle and then seasoned the tenderloin and sirloin respectively. I then wrapped the two pieces of meat separately in plastic wrap to preserve their unique shapes. We then poked several holes in the plastic so that air could be removed when we vacuum sealed the meat for cooking in a water bath. 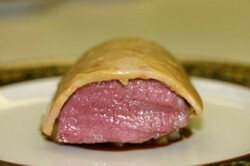 Here is a picture of the lamb loin before cooking. Tonight's menu. If you examine these three menus you will see some overlap of dishes and base elements integrated in a variety of forms. It is exciting for us to see the many combinations possible with individual ingredients and preparations. Here's a link sent to us from Alex Kentsis in Boston on how to make a thermostated water bath for sous vide for under $150. If anyone tries this, please let us know how it works out. So, Aki made mention of our fish glut and the fun I have with working with fish and chicken skin. The result, Coq au Vin. We reduced several magnums of red wine with agave syrup and a pinch of salt. 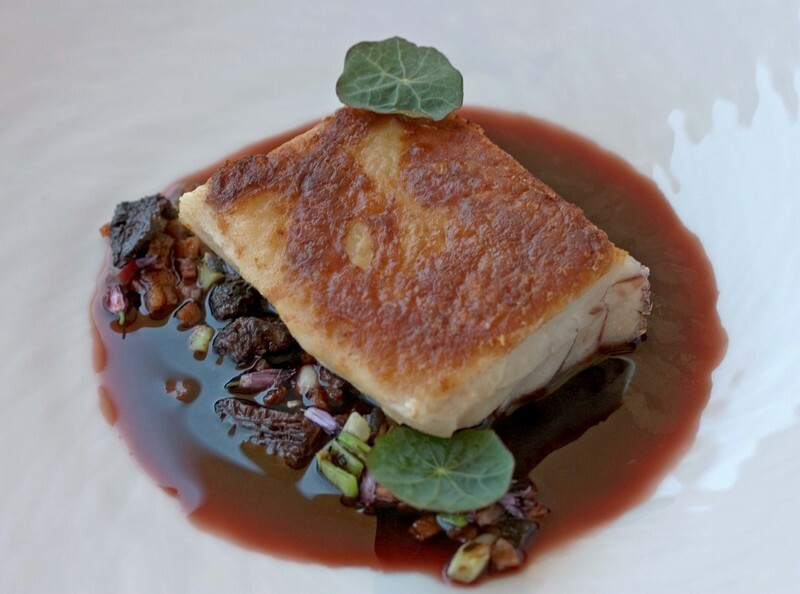 The result is the decadent red wine broth which we served with the chicken skin crusted grouper. The rest of the dish consisted of a ragout of morel mushrooms, bacon, grilled scallions, chive blossoms and nasturtium leaves. A simple dish based on a classic. Things are busy in Colorado. Barbara is in town and has everyone hopping. We have a steady stream of guests for the next few weeks and all of the challenges and pleasures that go with that. On top of that we're still reaping the benefits from our weekend in Aspen and all of the creative energy that sprang up from the exposure to new ideas and unique perspectives. Since I'm waiting for dinner service to begin I thought I'd take the opportunity to wrap up our tales from last weekend. From the experiences that we've had over the past two years I would have to say that there are several different levels of adventure at the Food and Wine Festival. There's the consumer experience which is made up mainly of foodies with a relatively large disposable income who are excited to be there and thrilled by random sightings of their favorite food celebrities at events and on street corners. There's the experience of said food celebrities and press who are wined and dined at private parties and exclusive soirees. Then there's the experience of the volunteers and workers who do most of the actual work involved in making the festival happen. Of that crew I think that the security guards have the toughest jobs, resembling bouncers at an exclusive club where everyone seems to be somebody important, at least in their own opinions. I saw more hostility directed at and around the security crew this past weekend than I've seen in the past year anywhere. The guys did a great job dealing with all of us (we exhibitors were the probably the worst offenders) and managed to keep smiling all weekend long. The exhibitors make up the last category of festival attendees. We as exhibitors and members of the trade were treading the middle ground between celebrity and consumer. We were invited to some but not all of the parties and we were able to take in a fair amount of seminars in addition to manning our table at the grand tastings. All in all I was pretty happy with where we were in the hierarchy. This is not to say that we wouldn't have loved to have been the people giving a seminar, teaching others about what we do and feeling extraordinarily special in the process. But I'm not the most social person in the world. Parties are as stressful as they are enjoyable for me and to be surrounded with all of these famous people can be nerve wracking. I've never been good at introducing myself to strangers, always preferring to be introduced by a mutual acquaintance for a point of reference and conversation. The way things worked out this past weekend were perfect. I got to meet some new people, renew acquaintances with some old ones and safely observe the madding crowd from within their midst without any personal pressure to perform. I may not be satisfied with that position in the future but for now it suits me just fine. Our mutually favorite seminar was Steve Olson's guide to Mezcal. It was informative, entertaining and thought provoking. It reminded me of why passion is such an important characteristic in anyone giving a presentation of any kind. He spoke a bit on the history of mezcal and it's definition (any spirit distilled from agave). We tasted agave syrup, roasted agave and seven different mezcals. Steve gave a great lesson on the art of tasting (Let the spirit hit the center of the tongue and spill down the sides, swish thoroughly and breathe out. Spit and then give a final slow inhale and exhale to experience the full flavor of the spirit.) It was the most detailed description of how to taste that I had heard in years. The range of styles and flavors were incredible and his presentation just a lot of fun. He had stories about each individual spirit and the people that created them as well as history and folk lore to round things out. It was one of those experiences that just made me feel lucky to be in Aspen. The other great seminar was Wine and Swine with Danny Meyer (who has a bookcoming out this fall) and Dan Phillips. We entered the tent to find rubber pig noses and six glasses of wine ranging from white to pink to ruby at every place setting. We tasted each wine with six different salamis from Salumeria Biellese and filled out a grid rating each combination on a scale of three: yummy, eh, and yuck. Danny Meyer explained that he liked to taste by salami, meaning that he started with one salami and then tasted it with each wine before moving on to the next one. I actually went the other way and tasted by wine using the bread provided to clean my palate after each taste of hot salami and change in wine. It was fast and furious. I don't have the list of wines and salamis here in the kitchen so we'll add it later. We had a great time at that tasting and it really made us think about individual palates as everyone's grid was different, and the art of pairing food and wine, any kind of food and wine. Last but not least we caught two cooking demonstrations by Jose Andres and Daniel Boulud. The first demonstration was by Jose and it was definitely personality driven. He was assisted by his two little daughters and his chef Katsuya Fukushima from the minibar. The girls provided a nice foil to Andres' dramatic flair and semi-serious demeanor. You can definitely tell that he has a television show as he excelled in drawing in his audience and amplifying the effect of his culinary tricks. It was very entertaining and as we were reminded, all of the recipes are detailed in his newest book on tapas. The seminar was named "Two Ingredients Ten Ways" but it was really one ingredient ten ways, watermelon being the second fiddle to the chef's machinations. 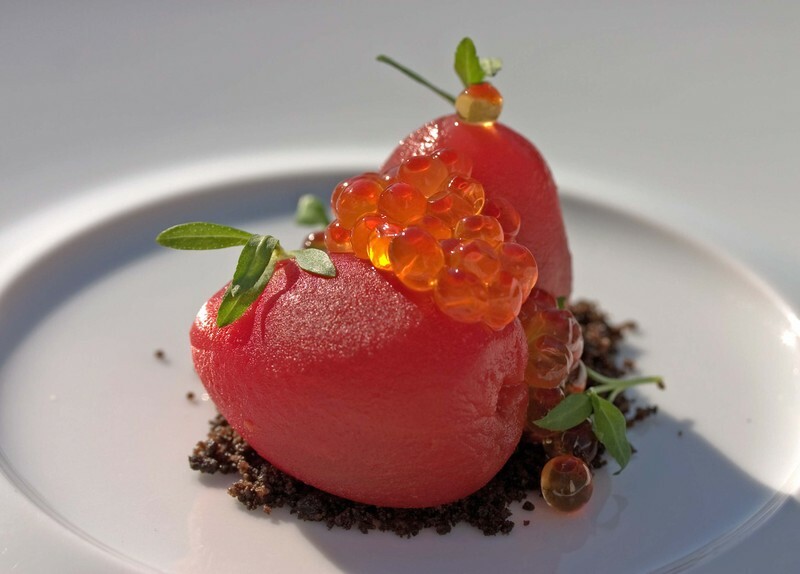 There was everything from watermelon juice cocktails to a watermelon "egg yolk" made with sodium alginate and calcium chloride. In contrast, Daniel's presentation was all about the food. He was congenial but restrained and there were no fireworks or special effects. There was simply the food which consisted of "Summer Cooking" with a heavy emphasis on fish and vegetables. The techniques were solid and the flavors were harmonious. Unfortunately his subdued style failed to hold the attention of his entire audience. Surrounded as he was by theatrical culinary competition and flashy personalities his seminar felt a bit slow and unimaginative on the surface. Those of us who were able to pay attention were rewarded by beautiful fish and vegetables, fresh, multi-layered flavors and textures, and some beautiful summer dishes. So, way back when we were in New York I had the opportunity to spend the day at wd-50, Wylie pulled this strange wool like substance from his cooler and said taste. It was light and fluffy and distinctly salmon. What a very cool product. He then pulled out the Washoku cookbook and flipped to the page with the recipe and a technique. Funny thing is I had the book sitting at home and had not picked up on the recipe, it kind of just passed me by. I was lucky to have it pointed out to me. Today we were working with a beautiful salmon and I decided to scrape the bones and use any trim to make this salmon cotton. I did not follow the recipe, go figure. I cooked the salmon down with soy sauce and our sake-root beer broth until the salmon was dry and fluffy. The flavor of the sake-root beer worked really well with the salmon. In some ways I was glad not to have the recipe and just work with the ingredients and inspirations at hand. The other key point I was reminded of is the fact not to take anything for granted and to take a closer look at everything. Oh, and when someone hands you the keys, thank them for giving you a chance to drive the car. 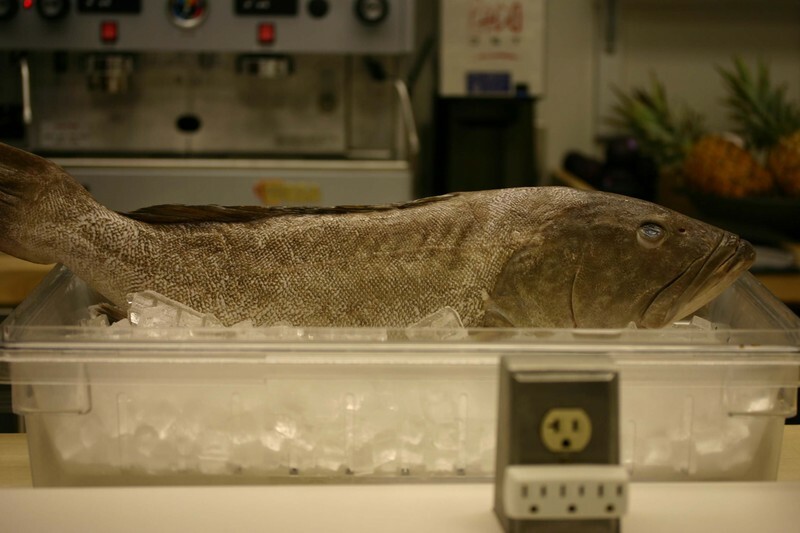 What do you do when you order a 5-pound fish and recieve a 14-pound black grouper from your purveyor? 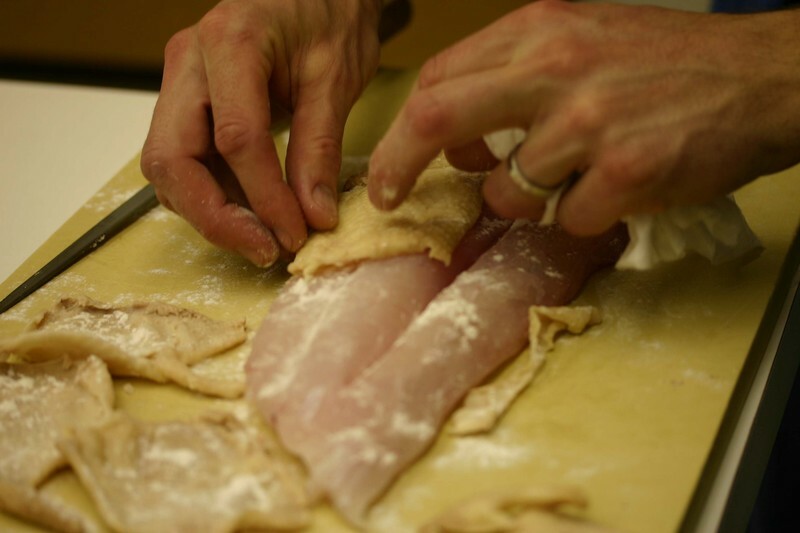 If you're Alex, you clean and fillet the fish, blanch some organic chicken skins and use a natural enzyme to glue them to the fillets. He then vacuum seals it with a FoodSaver to let the enzyme take effect and then will serve it for dinner later that evening. We are now back in the kitchen getting things geared up for a stretch of non-stop guests. 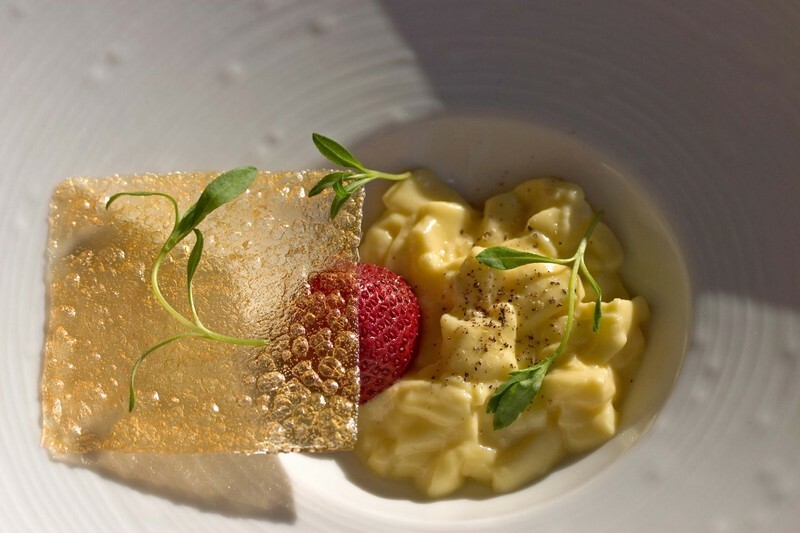 I was able to put the finishing touches on a dish which integrates our caramelized yogurt gnocchi. 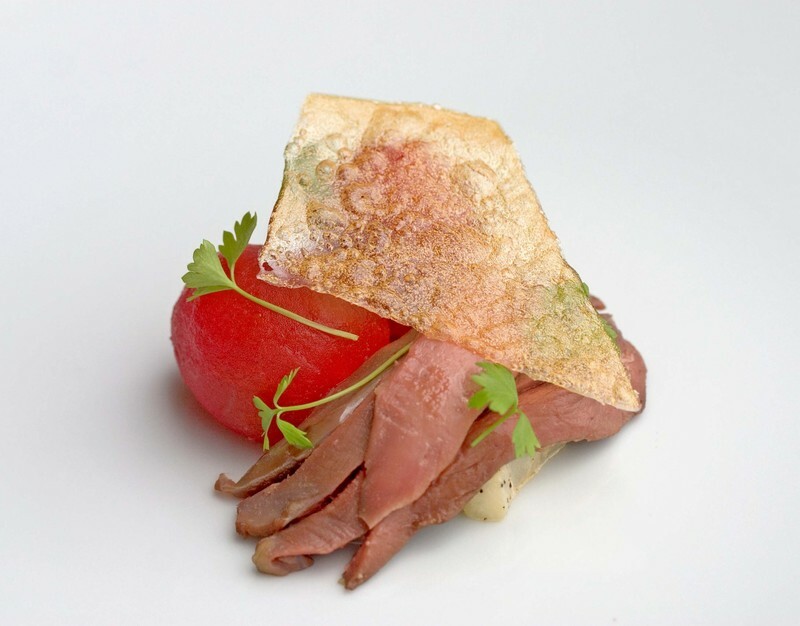 The dish is slow cooked juniper cured duck ham with caramelized yogurt gnocchi, confit strawberries and celery leaves. Cream butter with sugar, salt, baking powder and spices until light and fluffy. Beat in the eggs on at time, fully incorporating each into the butter mixture. Add ginger and blend well. Gently mix in flour and coconut milk alternately, beginning and ending with the flour. Fold in grated carrots by hand. Divide batter between two greased 9-inch cake pans that the bottoms lined with parchment paper. Bake in a 300-degree convection or 350-degree conventional oven for 25-35 minutes. 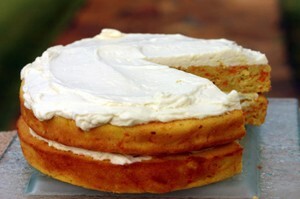 Cake is done when it is golden brown and the center springs back lightly to the touch. Let cool completely in the pans on a rack before frosting. We drove back this afternoon and we're both exhausted so this will be a quickie. Yesterday was a great day at the festival. We were very organized this year and actually made it to four different seminars in our free time on Saturday, all were good, but the two highlights were Mezcal with Steve Olsen aka wine geek and Wine and Swine (or was it swine and wine?) with Danny Meyer. More details on all of it tomorrow. We met some great people and renewed some old ties. Lots of people were familiar with Keyah Grande and Pagosa Springs this year. So we're definitely making progress. It was partially business, partially educational, partially social and completely enjoyable. I don't know if we'll make it back there next year but I'm glad we had the opportunity to be there this weekend. I drink coffee. Actually, I prefer a cappuccino-latte hybrid. In the words of Starbucks, a wet cappuccino. Anyway, it dawned on me this morning, no pun intended, how often I overlook the enjoyment of these daily stimuli. When the foam is just right and the espresso and milk blend in the abyss below I know at least for the moment the day is going alright. It takes a crisp morning away from the everyday to highlight the fact that even though something is consumed, used, done or thought of everyday that it still can be monumentally inspiring. I guess what I am saying is take a moment, even a half moment and indulge in yourself. Now look at the picture. Today we turned our caramelized yogurt into, guess what, yup--gnocchi. We are serving these little dumplings with Japanese eel and mango en papillote. A simple dish with tasty flavors. If you are not up for making the gnocchi, try the mango preparation. We chunk up a ripe mango with diced onion, minced jalapeno, a knob of butter, salt and lemon juice. We then wrap these ingredients in a foil package and bake it in the oven until the package swells and the mango is melting and tender. Another option which we employed tonight is to package the mango mixture in Fata Paper. We will then top the mango with the gnocchi and the broiled eel. Do as you wish. Bloom the gelatin in cold water. Drain and melt the gelatin on a low heat and set aside in a warm spot. Boil the water and whisk in the Methocel E4M to disperse it, then mix in the melted gelatin. Puree the cottage cheese, caramelized yogurt, salt and Methocel-gelatin mixture in a blender till just smooth. Chill the mixture in a bowl over an ice bath. Place the mixture in a piping bag with a round tip the size of the gnocchi you desire. Bring a pot of water to a boil and season it with salt. Turn the heat down to a bare simmer. Squeeze the gnocchi mixture into the water, use a pairing knife to cut the gnocchi off at a desired length. When the gnocchi float and are firm to the touch they are ready to serve. Add them to a warm sauce or ragout and serve immediately. Sometimes flavors come together and they just pop. I was inspired to make grilled potato cream after reading through the comments about my steak quandary. I was not sure what the heck I was going to do with grilled potato cream, but I knew I needed to make it. I took some raw Yukon Gold potatoes, sliced them thick in their skins and grilled them till they developed a crispy charred exterior. I then simmered the potatoes in cream with a solid pinch of salt. When the potatoes where tender the cream and potatoes were both absolutely delicious. I could not believe how tasty the two ingredients had become. I chilled the potato-cream mixture and then passed it through a food mill. The mixture resembled a potato porridge. Aki tasted it and said ice cream. I was game and grilled potato ice cream came to be. I flavored the porridge with some agave syrup for a bit more sweetness and thinned the mixture with some skim milk. I put the base in a Paco Jet container and today we had the now infamous grilled potato ice cream. The resulting ice cream is really tasty. I cannot get over how good it is. And yet, I can make it better. Perhaps I do not need to use heavy cream to cook the potatoes. I think the fat in the cream might mute the grilled flavor a bit. I could be wrong. Well and the current ice cream really is tasty. Here is how we used it tonight, though it could easily play a sweet roll as well. As a side note, you may have noticed Jack's Black Lime Catsup. That is the same catsup which was inspired by Jack of Fork and Bottle fame. The fun ingredient, besides jalapeno, which sparks this catsup is Indian black lime, a truly under utilized ingredient which has quite a character. More about the catsup soon. As chefs we know that we bear certain responsibilities to the diners in our establishment. It should come as no surprise to anyone that reads this blog that we are much more careful with the food we serve to our guests than we are with the foods we eat at home. 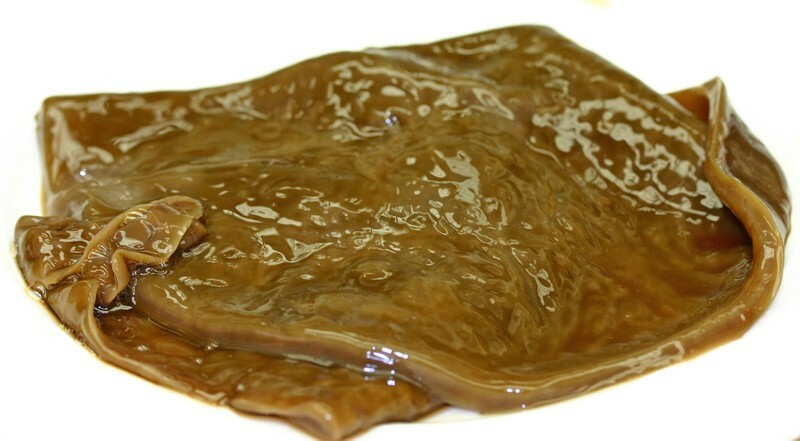 There are a variety of reason for this, the foremost one being that we are committed to serving the highest quality, best tasting food that can be procured. Certainly we make the best choices that we can for our guests. We do not purchase 100% organic because that's not always feasible but we buy organic where we can. We buy local products when possible as long as they meet our standards for taste and flavor. The same goes for free range, naturally raised products. There are items that we have to have in stock because our guests demand them. Sometimes they just want Heinz ketchup or Pepsi or Fruity Pebbles. They want the real thing and not our spin on these products. It's not my job to force them to eat what I think is right for them. As a chef it's my job to give people what they want if it's reasonably within my powers. The comments on the last post made me realize that I am bit out of the loop on high fructose corn syrup (HFCS). I've heard rumblings that it's a bad thing and that people should avoid it but somehow I missed the big picture. Perhaps it's because I don't drink soda or because I don't have children or because I don't cook with corn syrup, but the crux of the whole controversy passed me by. But when people take me to task for lack of knowledge I need to remedy the situation. So now I have another thing to educate myself about. As chefs people expect us to know about all of the hot food topics but if we kept up with everything and did our jobs, there wouldn't be enough hours in the day. We do the best that we can with what's available to us. When subjects come up we try to learn as much as we can and make educated choices. The food world has become something of a quagmire with differing opinions on the veracity of organics, the definition of sustainability and the meaning of free range and pasture fed. The right choices for each situation are murky and based upon personal assessments and vastly fluctuating levels of information. A case in point would be Heinz's certified organic ketchup. This is what we keep in house for guests who cannot live without their ketchup. It's Heinz so it's coming from a big agri-business. It's certified organic so the plants were probably only treated with an approved list of chemicals but probably came from a large farm that does not practice sustainability in any way, shape or form. It does not contain HFCS although strangely, it tastes slightly sweeter than the regular ketchup. It is a better choice that still satisfies the customer who wants their familiar product even though it may be slightly different from the one they have at home. It's not a perfect solution but it's the best one we have for today. Tomorrow there may be a better solution. We just have to take it day by day. This came about by accident. What, what came about by accident? The Long Burger of course. Summer is here and with a night off and company coming we needed a plan for dinner. Well, being me I wanted burgers and despite Aki's attempts to change my vision in the end we had burgers. (Please note Aki is now up 789 to -567 in points awarded for placating ones spouse.) Anyway, my vision was to have sliders on griddled English muffins. I was inspired by an episode of Good Eats where Alton Brown rolls out burger meat on a sheet pan, sprinkles it with onions and folds the meat onto itself, at which point he cuts small onion stuffed squares of burger, aka sliders. It turns out we had 1/3 pound burgers on griddled English Muffins and a whole quarter sheet tray of burger left over. 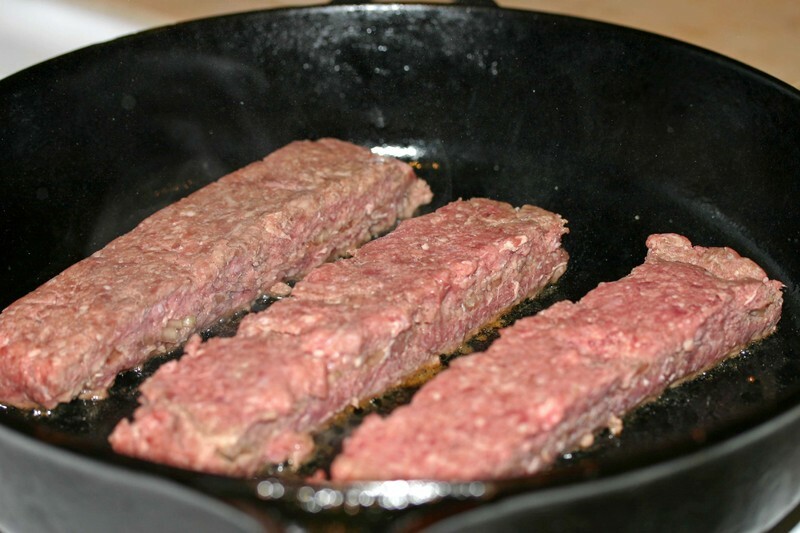 I just cannot eat what I used to and truly overstuffed the sheet pan when making the burgers. The next day, Aki was looking for some breakfast and just cut off a chunk of prepared burger meat and cooked it. 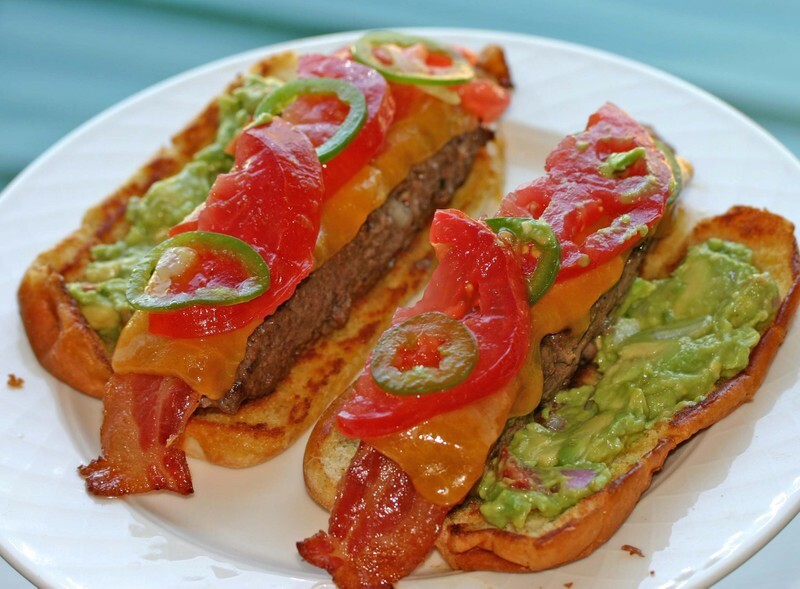 She placed the plank of burger on a baguette and added her own choice of toppings. I saw her eating the burger and was immediately thrilled. Aki had made a long burger. 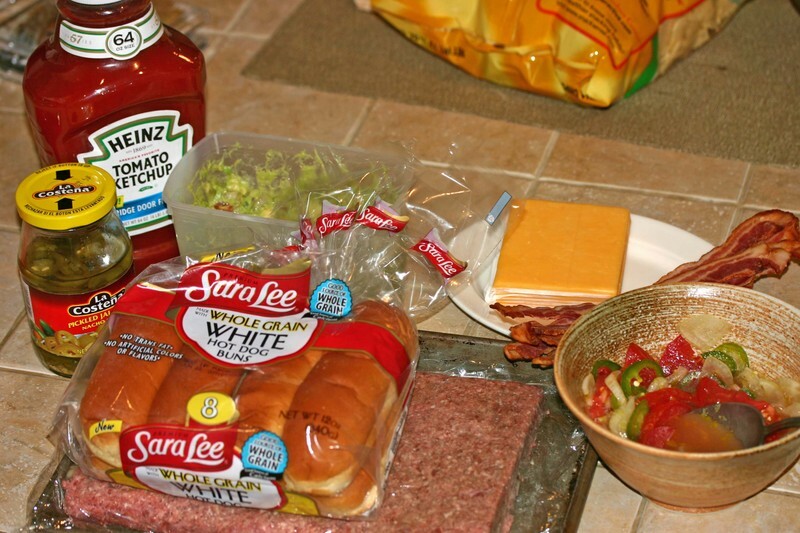 We went to the store and bought hot dog buns and she just smiled as I talked about all the benefits of a long burger. First of all, the meat can just be rolled out into a sheet and then cut into strips. Secondly, in terms of buns you now only need one. Third, they already make those paper holders to contain over sized hot dogs. I could go on but my loaded Long Burgers must be eaten. 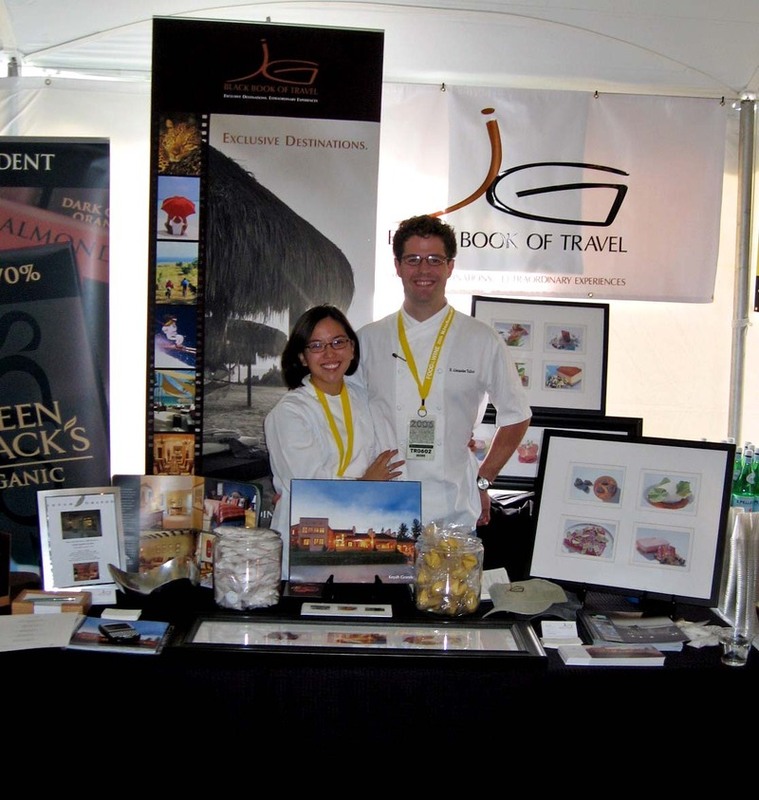 Next weekend is the Aspen Food and Wine Festival. We will be going back there again this year with Jena Gardner's Black Book of Travel. Jena's company represents Keyah Grande and she is graciously allowing us to share her table during the morning Grand Tastings on all three days. So if any of our readers will be there please stop by and say hello. Or email us and we'll try to get together in Aspen. Last year we gave away Vanilla Salt. This year we wanted to do something a little bit different. We opted for a finishing sugar. We took a coarse sugar and infused it with toasted sezchuan peppercorns and cardamom to create Sugar&Spice. It is a wonderfully aromatic sugar and we are using it in many different applications in our kitchen. 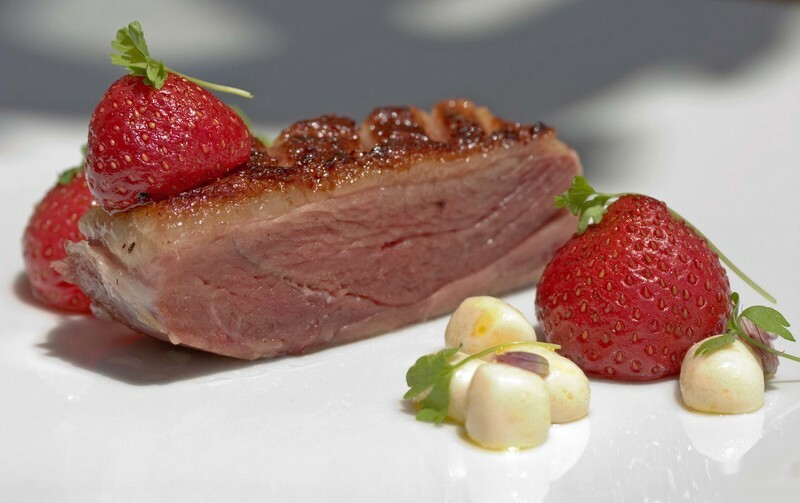 Most recently we were inspired by gorgeously sweet and tender strawberries. Having already made a strawberry pie delicately balanced with an elderberry syrup we wanted something a bit more traditional. The solution was strawberry shortcake and since we had the sugar at hand, we sprinkled it generously over the biscuits. They were tender, flaky and delicate with just a hint of crunchy, spicy sugar to balance out the juicy flavors of the berries. The biscuits themselves are amazingly easy and then all you need are pillows of softly whipped cream and the freshest berries you can get your hands on. Frankly, if there's good shortcake on the table, who needs dinner? 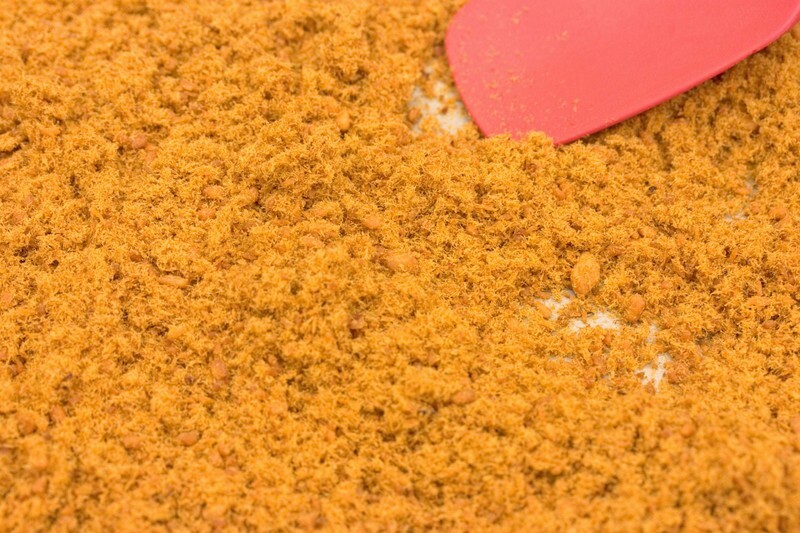 Combine everything except the cream in the bowl of a food processor. Pulse to the texture of coarse cornmeal. Pour in all of the cream and continue to pulse until the mixture comes together as coarse crumbs of dough. You may need to add an extra spoonful or two of cream. Turn the dough out onto the counter and gently press it together. It will look like like firm streusel topping. Pat it out to about a thickness of a half inch and cut out circles in whatever size you prefer. You can reform the trimmings and use them once more. Place them on a parchment or foil lined baking sheet and scatter them with coarse sugar. Bake in a 350-degree convection for 12 minutes rotating once until they are golden brown. Using a non-convection oven, turn the heat up to 375-degrees and watch the baking time. It may take a few minute longer. Let cool for at least five minutes before serving. Well, I continue to struggle with the issue of steak. Here we prepared the steak poached in butter and then grilled served with bagna cauda artichokes, (artichokes braised in a roasted chicken broth flavored with garlic and anchovies) roasted morel mushrooms and young broccoli rabe. The dish is absolutely delicious and our guests said it was the most flavorful piece of meat they have had in they could not remember when. (Hello, slow cooked in butter then charred on a grill) So, the guests were happy, the dish was tasty and I am just not able to get a grip. Hmm. We shall see what comes and how we are, no I, am able to get out of this bit of culinary quicksand. Perhaps I should just relax a bit and see what is underneath. 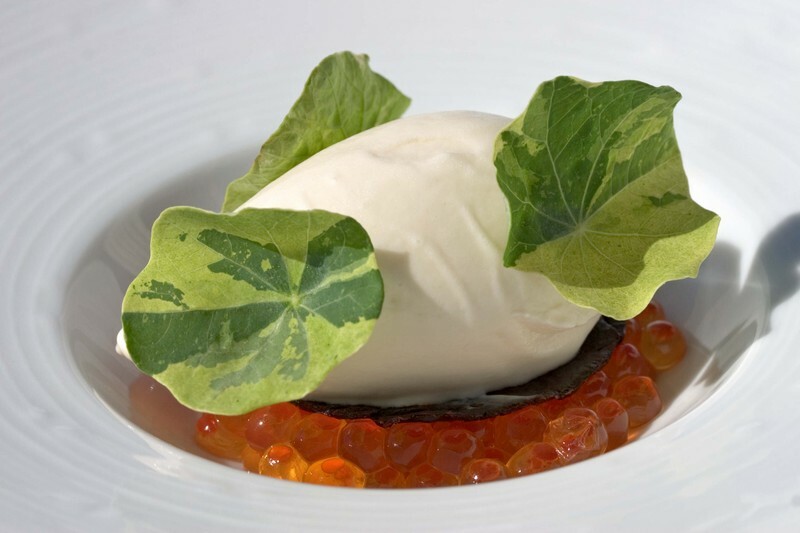 I started with the idea of glazing fish in a broth made with root beer and sake. The problem with my idea is that as I tried to glaze the fish, the broth lost its character and furthermore did not have the right viscosity to glaze the fish. Great, another failure. No, really great. There was truly something special about the broth which balanced sake and root beer. We added a dash of soy sauce and a pinch of salt just to pique the flavors in the root beer and the sake. So, I just looked at the broth in the wrong context. Instead of creating a glaze I just needed to use the broth as a broth. Pretty clever. 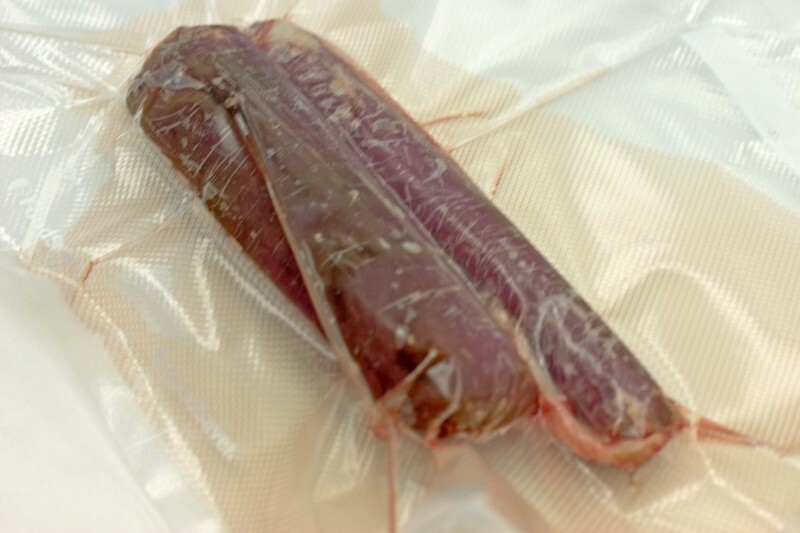 I put a squab breast and some of the broth into a bag and sealed it with our trusty food saver. We then poached it in the broth at 52.5 degrees C for an hour. 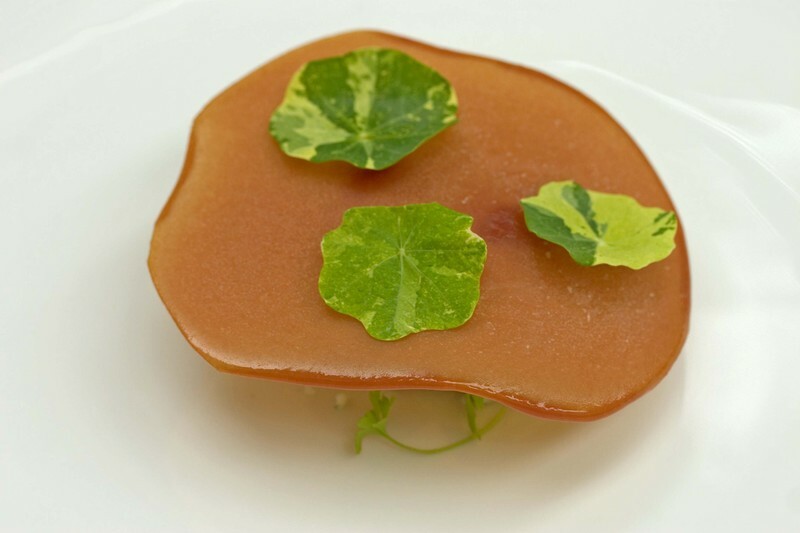 The result was the flavors of sake, root beer and squab had married into a harmonious whole. We served the squab with a ragout of porcini mushrooms and fiddlehead fern dumplings. A few shavings of preserved black truffle completed the dish. 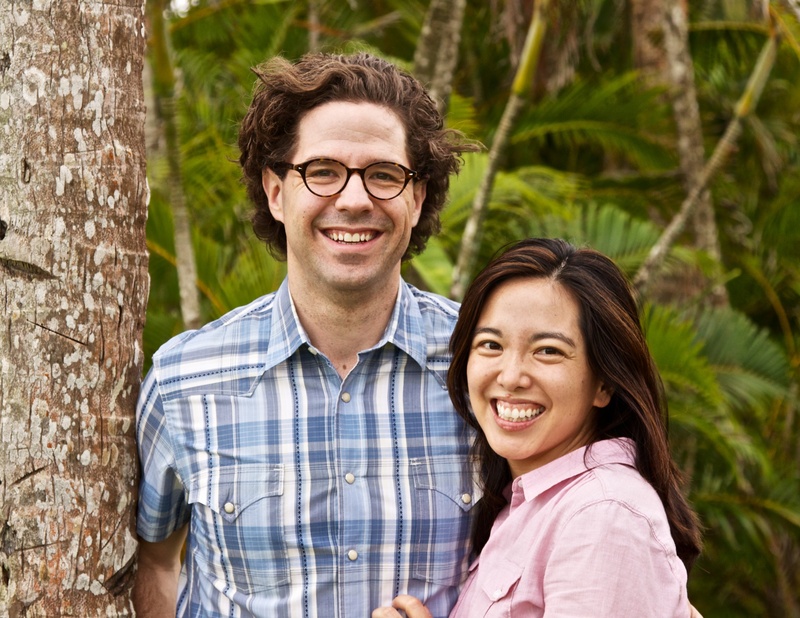 Here's a link to an interview we did with Ratha Tep of Food & Wine magazine on their website. This interview was actually the impetus that led to them inviting us to do a tasting for their staff at the magazine's offices. It's a little strange to see our words on someone else's website but it's a good kind of strange. So, check it out and let us know what you think of the interview! So I have been thinking about our onion glass a lot. I looked at differently this morning. Oh my, if I was not looking at crispy chicken skin. 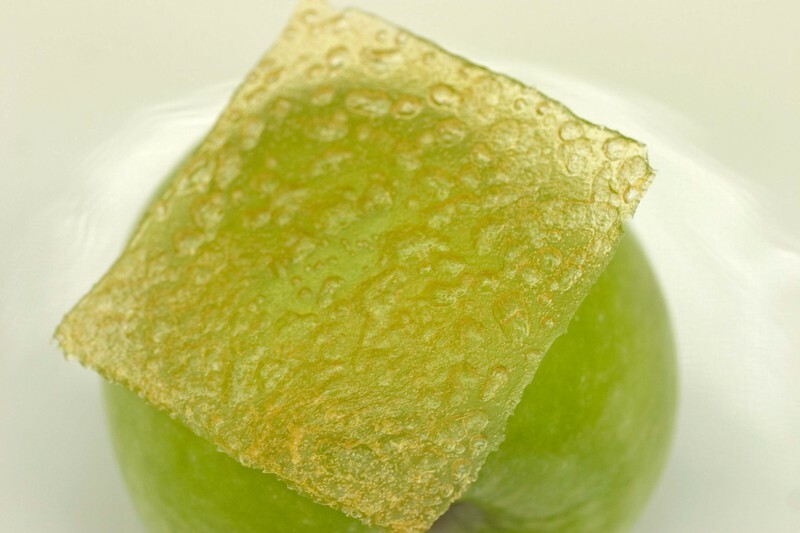 The squares of caramelized onion puree with their slight bubbles and dimples were a near perfect representation of crispy chicken skin, or squab skin for that matter. We have been working on squab preparations, seasoning and infusing the breasts with a variety of flavors from chorizo oil to sake-root beer broth. 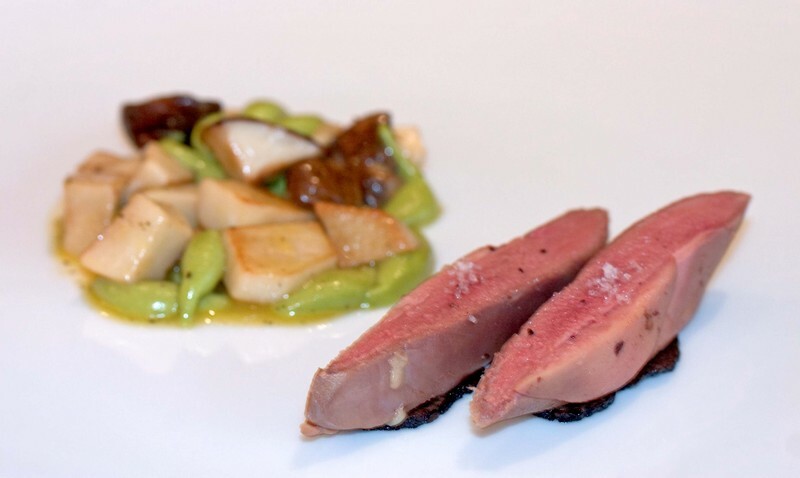 Those preparations are still in the works, though this morning yielded a simple and tasty squab dish where the squab and its false skin were happy partners. 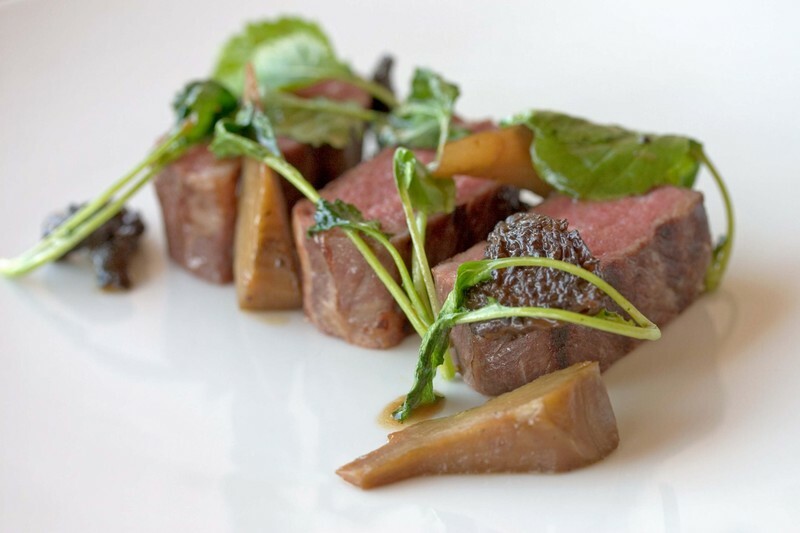 We poached the squab in an espresso-candied ginger sauce. We then served it sliced on top of creamed cucumbers along with marinated tomatoes, sliced jalapeno, celery leaves and onion skin. There's a really interesting interview with Anthony Bourdain on Bookslut. If you check it out, take some time to look around. If you love books, as we do, you will find lots of interesting information there. What I like about the interview is that it's very conversational as opposed to sensational. He really seems to be an fascinating man if you can get past the hype, not that I've ever actually met him. But that's the thing about good writers and entertainers, they draw you into their world and make you feel at home. That's what keeps you going back for more. My thoughts of steak must have really knocked something loose, because this morning I needed to work onions. I had thoughts of cheesesteaks and pico de gallo bouncing about my brain and so onions it was. I borrowed the idea of our ribbons and crisps and applied it to onions. I was looking for the rich caramelized flavor of an onion in a wafer thin and translucent crisp. The moisture content of the onion forced us to cook the base mixture longer as well as dry the glass out in the oven for an extended period of time. Besides these small setbacks, the onion glass worked out terrifically and is tasty to boot. Cook all the ingredients together until the onions are translucent and the liquids are reduced by half. (As you cook the onions, water will be extruded which then needs to cook down for the glass to work) Once the onion mixture is cooked, puree it in a blender until it is silky smooth. Pass the mixture through a fine mesh strainer. Allow the base mixture to cool, then spread thinly on a silpat using a template. Dry the onion mixture in a 200 degree F oven for one hour. Carefully remove the warm onion glass from the silpat and allow the to cool on a clean flat countertop. Store in an airtight container or use immediately. Does every dish need a sauce, emulsion, foam, vinaigrette, reduction, syrup, essence? Sure there are plenty of other words we could use for the seemingly integral element to many if not all dishes, though my list gets to the point. What it fails to question is the visibility of this element. What if the elements of a dish were flavored with or marinated in a sauce, vinaigrette etc. and then removed from it during the final preparation of a the dish? No, this is not a ground breaking thought. Well, it is. Several days ago we braised some hearts of palm in a broth made with Salers cheese and dijon mustard. We let the vegetable cool in the flavorful broth and when we were ready to assemble the dish we removed the hearts of palm and sliced them into rounds. The hearts flavor had married with the cheese and mustard. While I contemplated making a sabayon from this broth we felt the use of it in a simple dish would detract from the hearts of palm rather than enhance them. We were pairing the hearts of palm with porcini mushrooms: raw and cooked. For the cooked element we pan roasted the mushroom in butter and seasoned it with salt. For the raw, we finely sliced some mushrooms and marinated them in a lime juice and walnut oil vinaigrette. Finally, we integrated fat into the dish. To top the marinated mushroom we used Japanese eel. To top the crisp hearts of palm we used pounded avocado. 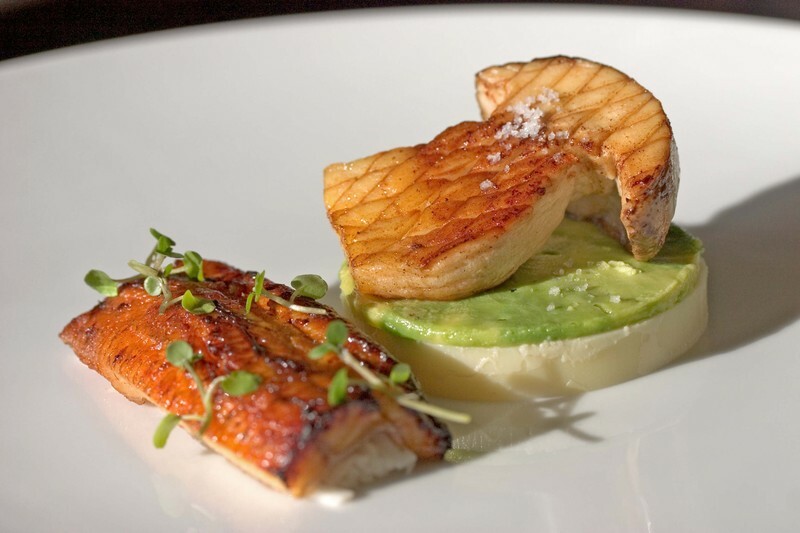 The avocado and the eel bring quite similar elements of fat and richness to the table while being quite different ingredients. We seasoned the eel with some young watercress and left the hearts of palm without spice for they had picked up elements of the Dijon mustard in the cooking process. As we assembled the dish I began second guessing myself, looking for sauce. Aki, being Aki and the voice of reason, detailed the above explanation and noted as we ate the dish that the sauces were integrated into just not visually apparent in the dish. And for the record, she was right...again. I gained the inspiration for this dish from the chef of bluezoo, Ed Bilicki. 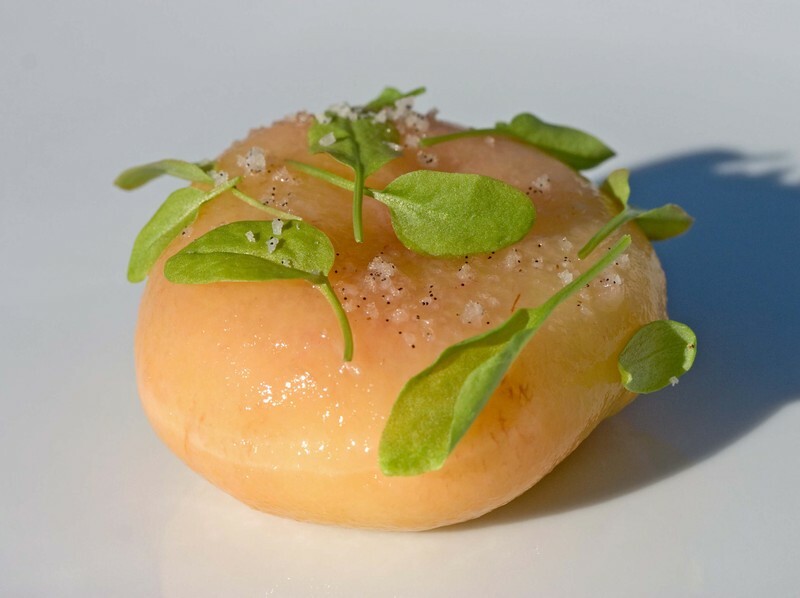 He made mention of the genius of Alice Waters of Chez Panisse who apparently a number of years ago served a ripe peach on a plate and called it a dish. I really liked the idea but had one hesitation. 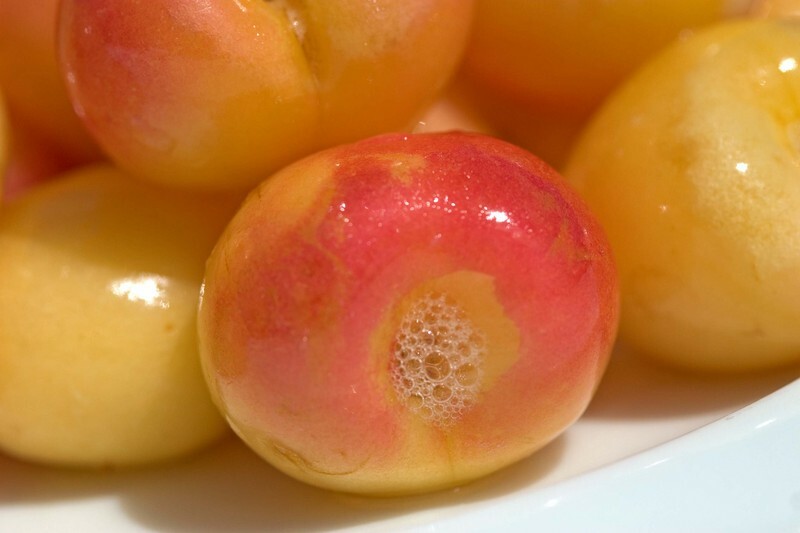 In theory the peach will be delicious if it is ripe and was well cared for and handled properly and truthfully there are many variables about the quality of that one peach. Like a great bottle of wine, you have an idea it will be great though without a taste there is an unproven variable. We tried to eliminate the variable. We peeled some beautiful peaches and then marinated them with elderflower syrup and lime juice. 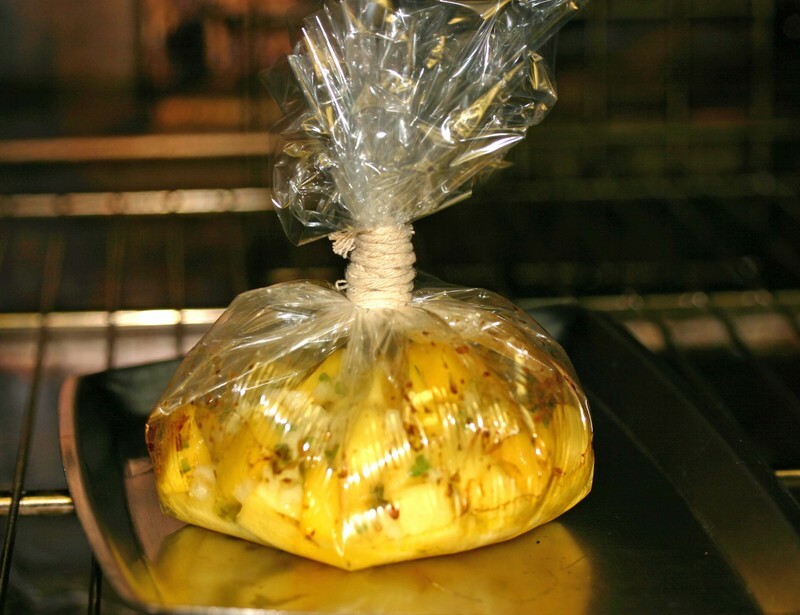 We then vacuum sealed the peaches to concentrate the flesh and help force the marinade into the fruit. This caused the peaches color to bloom. After several hours under vacuum we removed the peaches and extracted their pits. The fruit was ready to serve. I added several leaves of sorrel and some vanilla salt to accent the flavors of the peach. And so, we eliminated the variable. Did we make a better peach? I know we made a tastier peach. 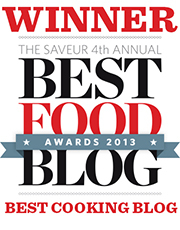 When we were in New York this past March we cooked a number of dinner parties for travel agents and media people. Bob Jamieson was one of our guests and became inspired to get his hands on some more of Diane's butter after the dinner. Yesterday I was reading about deviled eggs on Tigers and Strawberries. This morning as I was racing around the kitchen I put on a pot of eggs to boil. I didn't have any particular plans for them, I just had eggs on the brain. Deviled eggs are not something that I grew up eating. I actually refused to eat yolks at all until well into my teens and only then if they were soft and runny as a dipping sauce for toast. My Aunt was a lover of yolks, so hard boiled eggs were divided bewteen us. I never understood her enjoyment of the hard cooked yolks with their chalky texture which melted into a thick palate coating puree. I just couldn't see the allure. Alex, on the other hand grew up on Grandma Kitty's deviled eggs. When we had our catering company in New York, deviled quail eggs with various acoutrements were often consumed by guests with great enthusiasm. I was always amazed at how people responded to them. Deviled eggs were something that spoke to our clients, evoking memories of their childhoods which multiplied their enjoyment to the nth-degree. 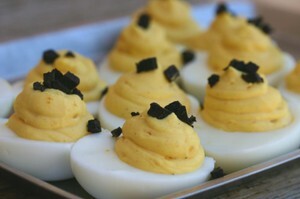 I discovered the simple pleasures of savoring the rich silky texture and slow blooming flavors of a deviled egg. As for plain hard boiled eggs, these days I hand all the yolks over to Alex. Some things don't change. Anyway, as I was peeling the eggs I remebered how much Alex enjoys the deviled morsels. Perhaps my subconscious was headed in that diection the entire time. I split the eggs, consuming any broken or unsightly whites in the process. Then I mashed the yolks with creme fraiche, hot sauce, hot smoked paprika, a splash of sherry vinegar, salt and pepper. I piped these back into the whites and presented them to Alex when he returned from walking the dogs. Never one to be outdone, he whipped open his reach-in and pulled out some leftover preserved truffles. He scattered the truffles over the deviled eggs and we've both been snacking ever since. It's one of thoses moments when we really appreciate the pantry of a professional chef. It looks like my stout vinegar project is a success. Over the past several weeks I have left my vinegar barrels alone and today I had the opportunity to check on the vinegars growth. I began by tweaking our tequila vinegar with a tequila-water-agave syrup supplement. Our port and maple vinegars are happily aging in their respective barrels. I emptied a few unfinished bottles of wine into our every wine vinegar and then put some cider vinegar in the smoker for another project. I almost forgot about the gallons of stout vinegar I had started several weeks ago until I knocked the glass barrel which holds our small batch of stout vinegar. Something moved in the barrel. I pulled the vinegar out into the kitchen and removed the cheese cloth cover. There was something thick floating on the top of the stout. Look what I found. mother. The stout had been converted into vinegar. I then ran back to check the five gallon buckets I had also set up to make stout vinegar. Three containers, three mothers, plenty of rich decadent stout vinegar. Now I need to find the right bottle to put all this vinegar into. And there is also all the opportunities to use this vinegar. I may start by making a stout-ketchup sauce. We shall see.